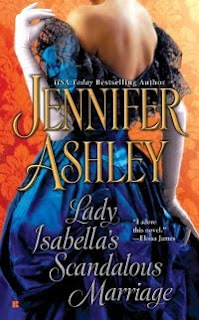 Lady Isabella's Scandalous Marriage will come out in July of this year, from Berkley Sensation. I'm pleased with the cover--I told the cover designers that Isabella wears a blue ballgown at one point, and this is what they came up with. Pretty. If you have not read the first book, this is a Victorian set historical romance series. You can read book 2 as a standalone, though of course you'll encounter characters from the first book. As time nears, I'll be posting more about the book, excerpts, and so forth. You can read about the series as a whole at The Mackenzie Series Page. The cover is amazing and I already have it at my place! Thanks, all. I just love this cover.